DeMoulin Bros. and Co. DeMoulin has introduced three brand new catalogs featuring a complete line of products for bands, drum corps, color guards and indoor performing ensembles of all types. The "Product Showcase," "Vivace Guardwear," and "Applause Formal Attire" catalogs offer thousands of uniform combinations in a variety of styles fabrics and colors. Request a copy at DeMoulin.com. Evans Drumheads Evans' next generation drum head, the Evans Corps Clear, is a two-ply design that allows drums to cut through the ensemble with clear and discernible pitches. By varying the thickness of both plies, the result is the world's first "self-EQing" tenor head, meaning the mid-frequencies that result in muddiness are removed without sacrificing tone, projection or articulation. Simply put, the heads offer a crystal clear sound that cuts. Learn more at EvansDrumheads.com. 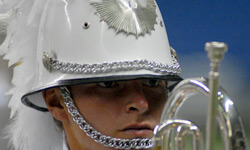 Fred J. Miller, Inc. Fred J. Miller, Inc. is proud to announce that the 2008 Drum Corps International World Champion Phantom Regiment, will use FJM uniforms, color guard performance wear, flags and color guard equipment starting with the 2009 season. Read more at FJMinc.com. 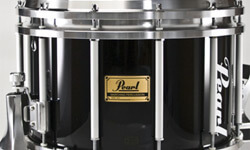 Pearl Pearl has redesigned its Championship ArticuLite Series Snare Drum. 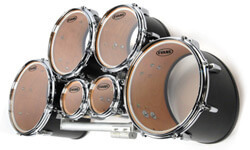 Strong, durable and lightweight, the FFX1410/A is designed to meet the complicated tonal challenges and sonic requirements of today's highly competitive indoor and outdoor percussion ensembles. The FFX1410 offers a tight focus and articulation with a crisp response, while still providing the warmth of Pearl's standard Championship Series. Learn more at PearlDrum.com. 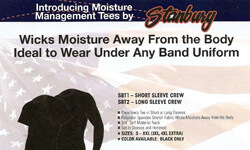 Stanbury Uniforms Stanbury recently introduced Stanbury Moisture Management Tees, a full line of durable moisture-wicking under-uniform garments, designed to keep performers comfortable in extreme heat or damp cold. They are available in all sizes and in short and long sleeve crew T-shirts, and knee- and full-length pants. Learn more at Stanbury.com.